SOESD - Learning Matters - Newsletter Archive - March 2007 - Grants Pass School District 7 Sees the Light! SOESD / Learning Matters / Newsletter Archive / March 2007 / Grants Pass School District 7 Sees the Light! Grants Pass School District 7 Sees the Light! Grants Pass School District No. 7’s internal network used to consist of point-to-point T1 (1.5Mbs) lines between the District Office and the schools (six elementary schools, two middle schools, the high school and an alternative education site). They chose to go with a routed network to cut down on the spread of broadcasts and to isolate potential problems. Each school has its own subnet with proxy at site. Local traffic stays within the building. Connections between the buildings are used only for traffic specifically meant for the Internet or another building. With the improved performance between the schools, they are planning to consolidate servers at central locations. For instance, they will be consolidating eight elementary and middle school Reading Naturally servers onto one machine at the District Office. Ultimately, they will have both middle schools on one server; and possibly all six elementary schools on another. Darcy Englen, Information Systems Supervisor, is looking forward to implementing many consolidated-server solutions district-wide that would not have been practical without the gigabit fiber connections. Currently the IS team is in the process of converting their mixture of routers and switches to a single vendor gigabit backbone, which will further improve performance and simplify maintenance. 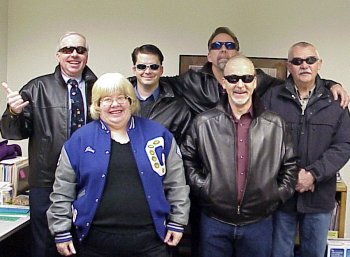 Learning Matters - Newsletter Archive - March 2007 - Grants Pass School District 7 Sees the Light!